A book may be edited to display additional reading material for individual modules of study, a staff departmental handbook, media files, or a showcase portfolio of student work. It is a way to import HTML sites directly into Moodle for seamless viewing. 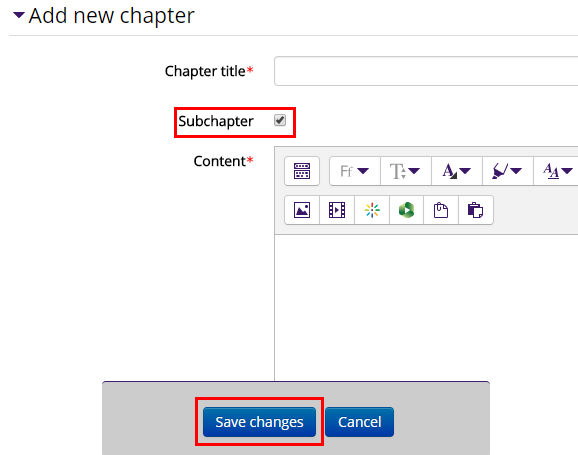 You can add Sub Chapters to an existing Chapter in a Book, as well as reorder, edit, or delete Chapters from the Table of Contents. 3. In the Table of Contents block at the top left, there are several options to edit a Book. 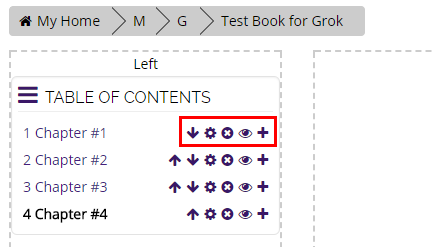 Here you can reorder chapters by clicking the up or down arrows next to them, edit the title and contents with the gear icon, delete it with the X icon, or hide it with the eye icon. 1. 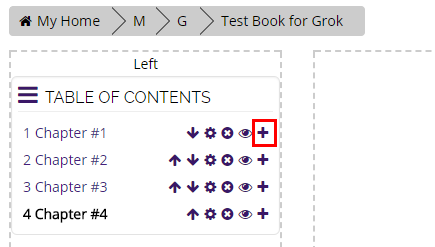 Click the plus icon next to the Chapter you wish to add a Subchapter to. 2. Enter the title of the Subchapter, make sure the checkbox next to "Subchapter" is selected, and write the Subchapter's content below it. Click Save Changes at the bottom when done. 3. The new Subchapter will be displayed, and you can see the Subchapter title underneath the parent Chapter in the Table of Contents. 4. For more information, please see https://docs.moodle.org/33/en/Book.